Live From The Wang: I.Am.Sick. So, I need to write a birthday post but as I sit here sucking in my much needed oxygen, I realized that I should share something with you. Pregnancy reduces your immune system's efficiency. This is how it keeps your body from destroying that little creature you are growing - which to your immune system is an intruder. I've learned this the hard way over the last two weeks. H1N1, a UTI and now......ready for the icing and little candy baubles for the cake? My regular physician holds office hours on Saturdays - so I went down there yesterday after a crappy sick birthday and feeling even worse Saturday when I awoke. He sent me straight to the hospital. I also learned that we have two hospitals in this county and one ER is full of people who have been shot, and one plays genteel new age music while surrounding you with soft wood tones and pastels and each ER patients gets a private room with a door that closes. Guess which one my doctor sent me to? They dropped an IV on me and a sent respiratory who pronounced pneumonia and everybody came by to jam stuff in my IV of various ilk and I napped until the ultrasound lady showed up to check and monitor the baby. My best story of my visit was that after they had me doped up and hooked up, they decided they wanted some pee. So the IV and I waddled down to the bathroom - and I do the WIPE of the va-jayjay and I've got the cup in my teeth......and.....I am sort of really sleepy and suddenly I realize I've peed. So I had to go back and tell my RN that I had FORGOTTEN to pee in the cup. Which she thought was fairly funny. They sent me home after several hours where I promptly went to bed, waking only for some dinner and then back to bed. My plan today is to lay on the sofa and watch football, and sleep. 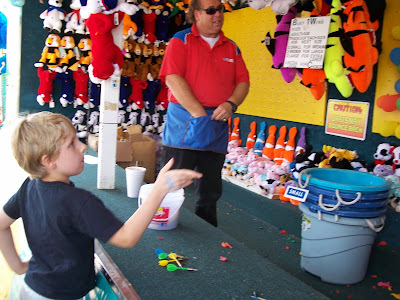 I leave you with a pic of the boy, executing a very stylish dart throw at the fair. So glad to hear you're home. Between you and my mom, I'm not sure who to worry more about these days! Get better!